I think we can all agree that ingrown hairs are just awful to deal with. It’s not just about they spoil the beauty of our skin. There’s also the problem of getting cysts, which is painful and it can take a long time until it goes away. What NOT to do When Removing Ingrown Hairs! In fact dealing with those pesky hairs that decided to grow under the skin instead of above is less time consuming than I first imagined and as I discovered, not that hard. It turns out that researching is quite useful and I am proud to say that I’ve dramatically reduced the amount of ingrown hairs in my case. I’ll show you in this post that ingrown hair removal can be easy and quick, at least from my personal experience. I’m sure you’ll find my tips useful. You are bound to get some ingrown hairs at some point or another so let’s see what you need to know about ingrown hair removal but also about how you can prevent them. The thought is quite unfortunate and there are few lucky ones who are safe from such worries. I discovered that some hairs cannot regrow back normally, at the surface of the skin. They take a U turn and start regrowing underneath. That mostly happens because there are dead skin cells that block the way. That’s a simple explanation on how ingrown hairs appear. I didn’t get ingrown hairs for many many years. In my early 20s I started getting some tiny black points at the base of my legs. I had no idea what those were. I turned to my girlfriends and I discovered that there are such things as hairs that grow underneath the skin. The black dots were easy to handle, I just needed to exfoliate from time to time. But I was lazy and young, I didn’t exfoliate regularly and it was a mistake but I had other things to worry about. In my mid 20s I started getting the more serious kind. There weren’t many, some here and there on my lower legs but they were starting to get noticeable because I mostly have coarse dark hairs and pale skin. It’s not the best combination for someone as hairy as me but I’m glad that I’m able to use an epilator, which has made my hairs become a bit thinner in time. Nonetheless, those hairs that left dark marks on my legs were something completely new to me and they were becoming really bothersome. No matter how much time passed they wouldn’t go away. I have many complexes so I lose my confidence easily. Those dark spots were constantly on my mind, making me self-conscious during the summer months. I become easily obsessed with negative things, especially about my appearance. I sound shallow, don’t I? And that’s how I started to learn more about how to prevent them but also about ingrown hair removal. Physical exfoliators should be used on a continuous basis. I use exfoliating gloves almost daily. Use them on dry skin before taking a shower and even after the shower. You can moisturize after if you have dry skin. If you have many ingrown hairs that have been with you for a long time then I recommend considering chemical exfoliation. You should combine the chemical exfoliation(such as ingrown hair removal creams or lotions) with the physical one. What chemical exfoliators do that makes them so effective is they dry out the skin. I mean really dry it out. 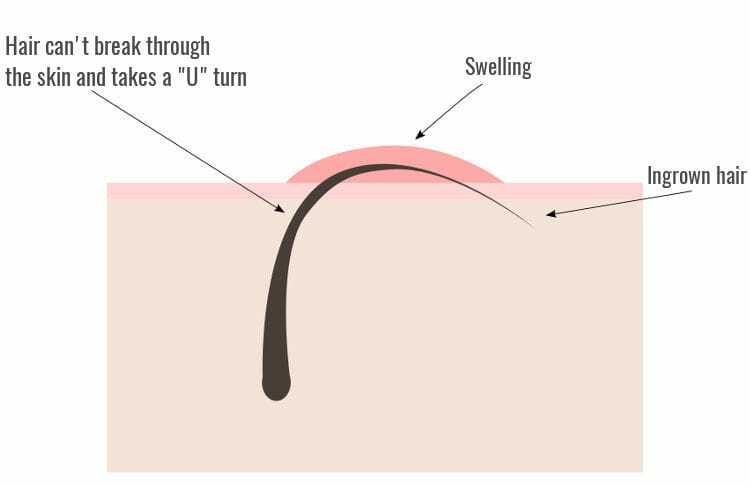 As layers of skin cells are removed, the ingrown hairs start coming to the surface. You can get rid of the dead skin cells easily with the help of a scrub or a pair of exfoliating gloves. You should also moisturize if the dry skin bothers you, it’s not a pretty sight. When it comes to methods about removing those hairs that grow under the skin there’s one thing that you should stay clear from. Don’t try to pop them out, to squeeze them like they were some pimples. From my personal experience I know that squeezing works when it comes to removing ingrown hairs. Then, what’s the deal you might ask? The problem is the scars that are left behind! Ingrown hair removal is not about scaring your beautiful skin. After all, that’s why you’re reading this, because you want to see your skin untouched by anything unpleasant. Don’t repeat my mistakes because you will suffer from them for many months to come. Even if the ingrown hair has become a cyst that looks like a zit that’s just calling you out to squeeze at it until there’s nothing left, it’s best to just leave it alone. In the case of a cyst, get a cotton cloth, dip it in warm water, and rub the cyst with it. Do this daily whenever you remember or as often as you can. Also, you can use acne medication if you have some around the house to reduce the swelling. As I mentioned previously ingrown hair removal is all about exfoliation. Here are a few great products for physical and chemical exfoliation that are quite effective in reducing and ultimately preventing those hairs from growing under the skin. The Earth Therapeutics Exfoliating Hydro Gloves are perfect for daily exfoliation. Physical exfoliation removes the layers of dead skin cells without harming the skin. Even people with sensitive skin, like myself, can use them without any risks. I use argan oil to maintain a smooth look because it’s also non-comedogenic. It means that it doesn’t clog the pores. It allows the skin to breath and it makes it easier for the majority of hairs to break through the skin and grow normally at the surface. I say the majority of them because there will still be some that will grow underneath, even if you exfoliate diligently. You can skip it from time to time if you are in a hurry. But it’s best to create a routine and stick to it. It’s a very important step in your ingrown hair removal efforts but it also helps to prevent them too, which is highly important. The Earth Therapeutics Exfoliating Hydro Gloves are pretty affordable, you would have to replace them once every couple of months or so. Use them on dry skin before taking a shower and once again after taking the shower. Rinse with lukewarm water after. Don’t forget to wash the gloves and let them dry properly otherwise they will start to smell. The Majestic Pure Himalayan Salt Body Scrub with Lychee Essential Oil is another amazing product that can be used daily. Use it on dry skin and massage the skin with for a few minutes. It not only helps you maintain a clear skin but it also acts as a moisturizer thanks to the lychee essential oil. Also, the oil is a great source of Vitamin C, which speeds up the healing process. Blemishes and marks will fade a bit faster this way. What I also find interesting about this scrub is the whole holistic approach. I’m quite into products like that because I love taking care of my skin by using pure and natural products. The Majestic Pure Himalayan Salt Body Scrub with Lychee Essential Oil is all about natural ingredients. It’s quite an impressive body scrub but if you don’t want to spend the money, there are plenty of DIY recipes. With a quick search, you will find plenty of body scrub DIY recipes in a matter of seconds. The Pfb Vanish is a bit expensive but it’s also highly effective, even against the most deepest ingrown hairs. There is no such thing as an ingrown hair removal cream. The only method is exfoliation, whether physical or chemical or a combination of both. If you have some serious ones, it’s best to use it twice a day, in the morning and in the evening. You can also use it after hair removal, no matter if you shave, wax or epilate. It will calm the skin. After the solution dries, don’t forget to moisturize. The fact that it’s a roll on makes it incredibly easy to apply. It can be used on the entire body, including the face and the intimate area. It doesn’t stain clothes so you don’t have to be wary about anything. It’s a simple clean process. It’s best to avoid touching the Pfb Vanish with bare hands because it causes the skin to peel. That’s how it helps remove the ingrown hairs. So always wash your hands after. If your skin gets too dry, use a moisturizer to maintain a nice smooth look. If I were to have one complaint is the fact that it’s not available globally. It’s not easy to get. It’s a pity since it would benefit so many people. This is another chemical exfoliator. It’s just as good as the above one but it’s actually much cheaper. It’s an amazing product, one of the best for ingrown hair removal so I highly recommend it. Besides that, you can actually use it after shaving/waxing/epilation in order to reduce the redness. If you use the Tend skin solution the irritation should be kept to a minimum. You should always remember to moisturize after each hair removal session. In order to get rid of those stubborn hairs that have decided that it’s best to stay under the skin and continue to grow there, apply the Tend skin twice daily, in the morning and in the evening. Rinse your hands after each application in order to avoid skin exfoliation on your fingers. That would not be pretty. It can be used on the entire body, including the face and the intimate area. I mentioned earlier that the number one thing that you should stay away from when thinking about various ingrown hair removal techniques is squeezing the skin so that the pressure would make the hairs pop up from underneath the skin, just like you do to a pimple. There is an alternative, with minimum scaring possibilities. It’s the perfect ingrown hair removal tool: a pair of tweezers designed especially for getting rid of ingrown hairs. It obviously works for removing splinters, too. After all, the procedure is similar. Using a special pair of tweezers, like the one from Majestic Bombay, is the only acceptable ingrown hair removal tool. They’re different from a normal pair of tweezers, they’re just like two strong needles that cause a minimum invasion and are powerful enough to grab the hairs and pull them at the surface. There won’t be any pain at all. You should only think about using such a pair of tweezers after you’ve exfoliated and the results have been unsatisfactory. It’s all about exfoliation. About taking care of your skin. Even though a bit of effort is needed and a bit of your daily time, it’s worth the trouble. Firstly, for prevention and secondly, for getting rid of ingrown hairs. There not many ingrown hair removal products so you won’t be disoriented and you don’t have to go through a lot of trials. It’s just a matter of exfoliating on a continuous basis without getting lazy, like I used to. A few years back, I remembered about my legs only when summer was approaching. During the cold months I continued to epilate but I forgot all about body scrubs and exfoliating gloves. I am pretty sure that I could have prevented those serious ingrown hairs from appearing. At least I have a first-hand experience of how troublesome those things are, how annoying they can get, and that they can make us unhappy with our looks. For me, it was indeed horrible. As you can see, I’m still complaining about it even now. Is this the first time that you thought about exfoliating? Or are you just looking for a better solution? Those are my tips on ingrown hair prevention and removal that I discovered because I was forced to but there might be something that has escaped my research. Is there more that I need to know? How have you been dealing with your ingrown hairs? I would just love to hear about your own experience! Also, if you have any questions leave a comment, I will answer as quickly as I can. Rima, it has taken years for some of my scars to go away. My skin heals slowly and scars fade away slowly, it’s always been like that for me. In order to get rid of ingrown hairs, you need either the Pfb Vanish or the Tend skin solution. They’re both good so get whichever you can find. Apply the exfoliator twice daily or at least in the evening if you don’t have time in the morning. If your skin gets too dry, you can use a body scrub and moisturize after. At the moment, I’m just using a body scrub on dry skin before the shower and on wet skin at the end of my shower and then rinse. Then I moisturize because my skin is really dry. Let the scarring heal on itself, if you get rid of your ingrown hairs then you’ll have a lot more patience.